Last time we looked at the history of GO as Edge Hill’s staff and student portal. 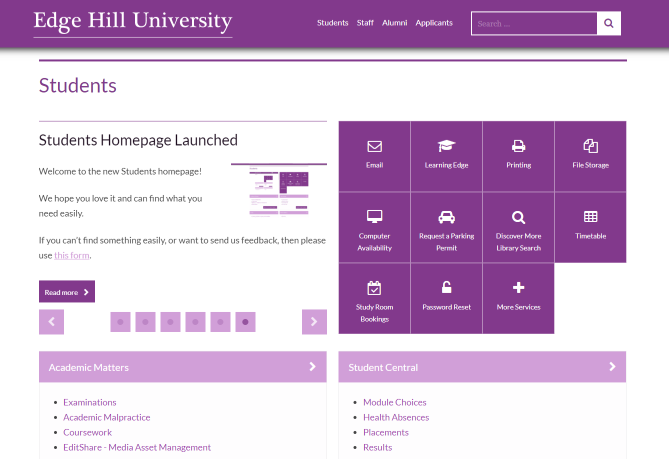 While GO offered customisation, in the design of new student and staff homepages we are looking to offer a standard set of functionality to provide quick and easy access to the information and services that the majority of users need most frequently. Our Google Analytics data shows that most users logging in go straight to key university systems and services like email, Learning Edge or access to files so these have the greatest visibility. Some services are popular only at certain times of the year so it’s important to improve visibility of these links during those periods both to promote their use and to make them easier to find. Something like requesting a parking permit is going to have a flurry of activity this month, but quickly tail off and following the initial surge of requests, it’s okay for it to be discoverable through different routes. Not everything can be a top level link and we need to provide access to the wide range of information and services used by staff and students less frequently. We’ve categorised and grouped all the links to information and services we provide from these new homepages into a handful of broad headings like Living and Money Matters. These purposely don’t map directly to departments as often users don’t know (or care?) who provides a service, they just want to find something out or get something done. Each category might have its own top/popular/timely featured services which serves the purpose of highlighting the kind of information inside and providing quick access to commonly used systems. First up – “solving” website search is hard, like, really hard. I’ve been trying for the best part of ten years to make the best possible site search and it’s impossible to get it right for every search query from every user. There’s a reason Google have thousands of engineers working on the problem. We’re able to tap into some of that work and we currently use Google Site Search to power our website search engine. It works on a subset of their main search engine index meaning only public web pages can be included in the results making it useless for GO which was all behind a login but ideal for our new student and staff homepages where we link to public “gateway” pages rather than directly to the authenticated system. By using Plain English and adding metadata to pages we should be able to return relevant results (e.g. we need to return the page about Intercalation when a student has never heard that term types in take time off). It’s not going to be perfect and please let us know when you come across things you don’t expect! Last time I talked about how the customisation features of GO have a very low adoption rate and introduce support challenges but with personalisation we’re taking a different approach. We’re looking at ways to supplement the default user experience with additional functionality tailored the users needs and usage patterns. For example if there is a particular service that a user accesses on a regular basis we might bump it up the list so it’s quicker to access. If a user is already logged in then we can provide students with links relevant to their course and staff links appropriate to their role and department. Unlike the customisation features in GO, this won’t require the user to do anything extra and it should supplement default content making support easier. We have a few technical challenges to overcome before we can push some of this functionality out, but it’s coming Real Soon Now.